The 19th FIFA World Cup kicks off today. The advertising for the event was out of control in South Africa - you couldn't escape it if you tried. 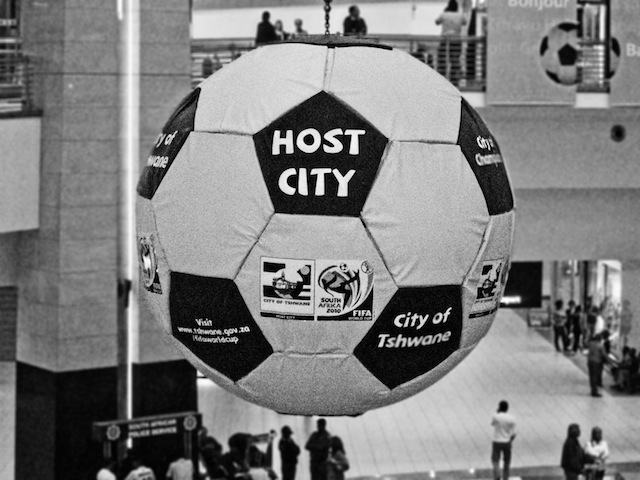 South Africans are incredibly proud that the game is being hosted there this year and all we talked about with every cabbie was soccer (a.k.a football). Neither of us being sports fans, we would just tell them that we were from Canada and that our team never qualifies - which would usually result in a conciliatory chuckle. I know we're going to try to avoid watching any coverage on T.V because we can't stand the noise of those ridiculous vuvuzelas. 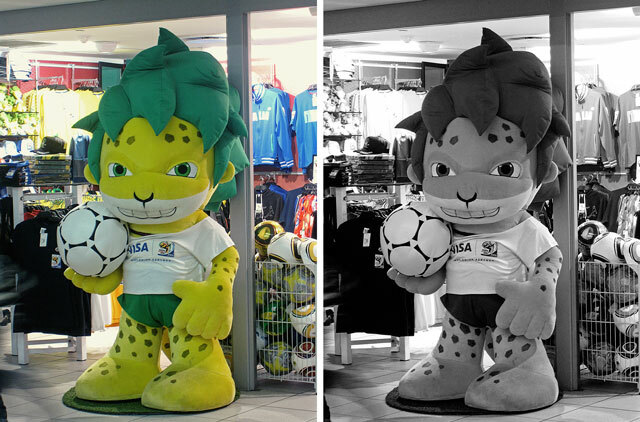 These photos of the FIFA mascot and soccer ball were taken at the Johannesburg airport before we boarded our plane for Cairo. South Africans should be proud. But I agree with not being around for the festivities. You're going to AVOID watching it? It's the World Cup!! You HAVE to watch it. I think it's some kind of international law, or at least the morally and spiritually correct thing to do. How amazing to be there as the games kick off. Sports fan or not, it must be so cool to see a culture come together around one event. I've just watched the first game and OH my god, those vuvuzelas (I'm assuming) were the most god awful annoying things I've ever heard! I'm hoping that the games that don't involve South Africa calm down a bit, because it sounds like a swarm of bees! i'm finally just now getting into the spirit of it- cape town was an amazing to be in last night. but i agree- the vuvuzelas are so annoying. oh my gosh, me too! Maybe I could try watching on mute, but those things drive me CRAZY!! I can't imagine actually being there in person! ugh I hate the sound of those things! shut up already!!! i'm the opposite ... i can't get enough soccer. i seriously wake up at 4 am just to watch the games "live" on t.v.